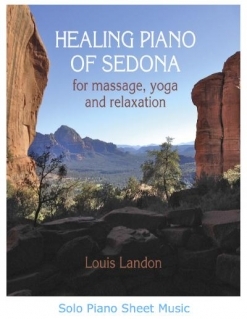 2016 / Landon Creative, Inc.
Healing Piano of Sedona is the companion sheet music book for Louis Landon’s 2014 album by the same name. Subtitled “for massage, yoga and relaxation,” the twelve original piano solos are almost as relaxing to play as they are to listen to. 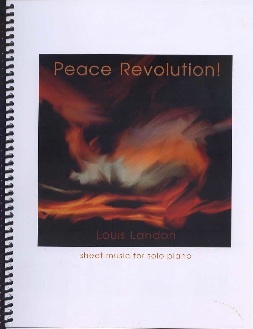 Landon is a life-long musician with playing chops to burn, and much of his sheet music can be quite challenging, but because of the nature of this music, several of these pieces are much easier to play than some of his previous sheet music releases. My review copy of the book was downloaded, but Landon’s earlier books have been spiral-bound, and I assume the hard-cover version of this one is, too. The notation and layout of the music is well-spaced and easy to read. Most of the pieces have suggested pedaling and metronome settings. Several pieces have reaches of a tenth, but most of those chords can be rolled or shortened to better suit the span of smaller hands. (There aren’t enough of those kinds of chords to pose any kind of a problem for most pianists.) Because there are fewer jazz rhythms in this book, most of the timing is easier to count and a few of the pieces have repetitive left hand patterns. Most of the pieces are relatively short (3-5 pages) and there are no difficult key signatures (see below for details). 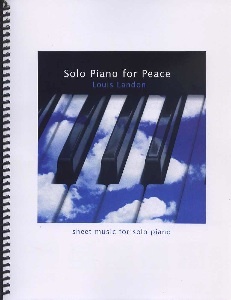 This is a very enjoyable book to play and even though the music is quiet and peaceful, there is plenty of variety from one piece to the next to keep almost any pianist interested from cover to cover. For a description of the individual pieces please see my review of the recording. 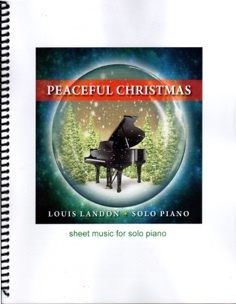 The songbook is available from www.louislandon.com. Recommended!